I love the process of making a roux. Whisking together oil and flour and then watching it turn from a light brown into a deep chocolate color. The smell changes too as it slowly cooks; an almost nutty scent to start and then changing to a scent I can't even describe well, but it's aroma fills the kitchen and is completely unique to this process. The process takes time too. You whisk constantly, ensuring that it doesn't burn and questioning every minute if you've gone far enough. It might take a few trials to get it right too, but eventually you'll just know when it's right. 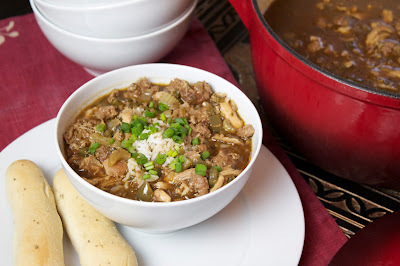 For this version of gumbo I used some smoked turkey stock that I had canned earlier this year. I was worried that it might be too overpowering but it ended up being a perfect combination with the other flavors and it's something no one else can replicate without creating their own smoked stock. Chicken stock would be the next best thing but if you're ever around, we'll make this one day and then you'll know what I'm talking about. 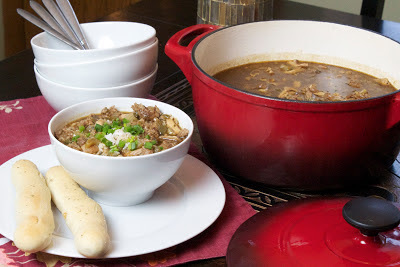 Cook sausage in a Dutch oven over medium heat, stirring constantly, 5 minutes or until browned. Drain on paper towels, reserving drippings in Dutch oven. Set sausage aside. Cook chicken in reserved drippings in Dutch oven over medium heat 5 minutes or until browned. Remove to paper towels, reserving drippings in Dutch oven. Set chicken aside. Add enough oil to drippings in Dutch oven to measure 1/2 cup. 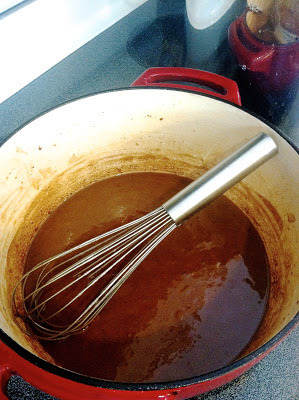 Add flour, and cook over medium heat, stirring constantly, 20 to 25 minutes, or until roux is chocolate colored. Stir in onion, bell pepper, and celery; cook, stirring often, 8 minutes or until tender. Gradually add 2 quarts stock, and bring mixture to a boil; add chicken, garlic, and next 6 ingredients. Reduce heat to low, and simmer, stirring occasionally, 1 hour. Remove chicken; let cool. 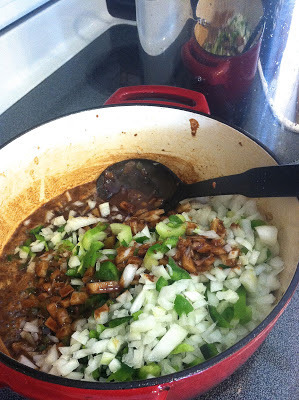 Add sausage to gumbo; cook 30 minutes. Stir in green onions; cook for 30 more minutes. Bone chicken, and shred meat into small pieces; return chicken to gumbo, and simmer 5 minutes. Remove and discard bay leaves. Remove gumbo from heat. Sprinkle with filé powder, if desired. Serve over hot cooked rice. Garnish, if desired. 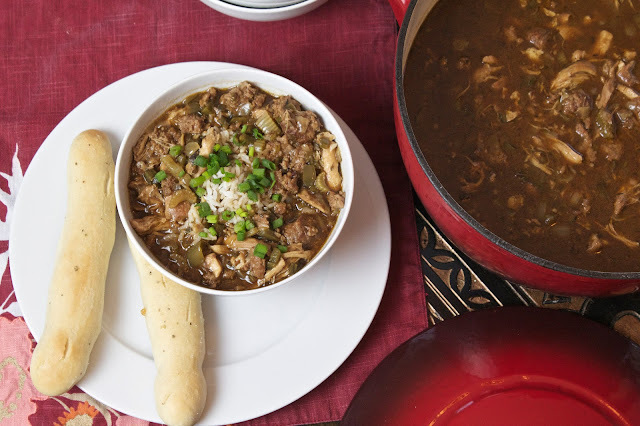 I've never tried gumbo but I love the flavors you used! Perfect for those cool winter days her up north! "First you make a roux..." :) Can't wait to try your version. Sounds yummy! Thank you! That's a good way to do it. I use a slight variation. I make my own chicken stock the night before, then pick all the meat off the boiled chicken for the gumbo. If I'm feeling naughty, I'll skim the fat off the top of the stock and use that as my roux base. Better yet, go to and Asian market and do the same with duck. This is a effective article of Chicken and Sausage Gumbo.This is article many many everyone help for us.It is very good article.So nice,this is a nice post.I also want to show about on Some people have bad opinions about trucks provided on community selling at Auction for trucks, considering that many of the models on community auction are already poorly broken and with comprehensive problems. While this can be real, not all models were poorly managed and irresponsibly used by their past entrepreneurs. Actually, there are some Auction for trucks that are a little bit used with low usage, and they look like product new; they are also in ideal operating situation, yet they are still respected at very low costs.